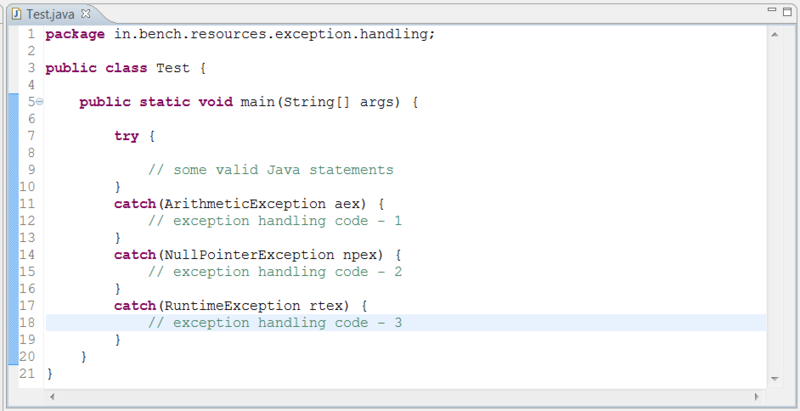 Q) What is an Exception in Java ? Q) What is an Exception handling in Java ? Q) Explain exception hierarchy in Java ? Q) What is the difference between Exception v/s Error in Java ? Q) What is the super class for Exception & Error in Java ? Q) What is the difference between checked exception v/s unchecked exceptions in Java ? Q) Explain important keywords in Java Exception handling ? Q) Is it valid to keep only try-block without catch-block or finally-block ? Q) Whether multiple catch is possible for single try-block ? Q) What are rules for declaring multiple catch-blocks ? Q) Whether it is very mandatory to include curly braces for try-catch-finally block, what happens if not included ? Q) Whether nested try-catch block is possible inside outer try-catch block ? 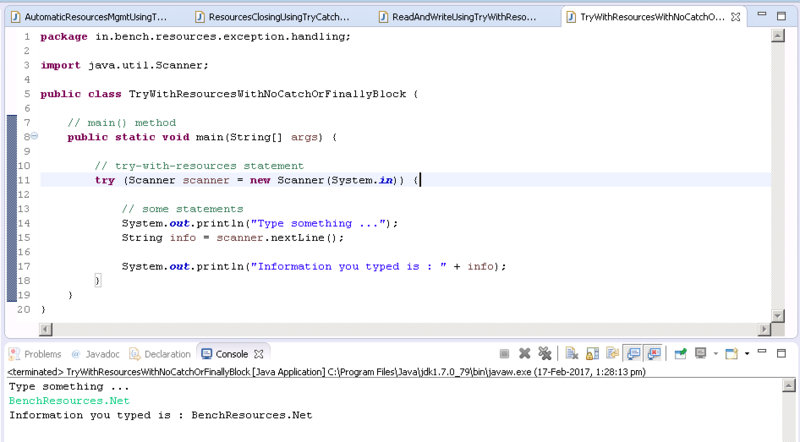 Q) Can we write any Java statements in between try-block & catch-block ? Q) What is the main purpose of finally-block in Java ? The main purpose of finally-block is to perform clean-up activities or code clean-up like closing database connection & closing streams or file resources, etc. Q) Can we have finally-block followed by try-block (without catch-block) ? Q) Whether it is possible to write any statements after finally-block ? Q) Whether finally-block always executed, irrespective of any exception ? Q) Will finally-block always be executed, even if there is return statement inside both try-block or catch-block ? Q) Explain various possible combinations to write return in a method enclosed with try-catch-finally block ? Q) Whether exception raises from catch-block ? Q) Whether it is possible to declare catch-block with same exception-type twice, for example ArithmeticException ? Q) What are various methods available to print exception information in console ? Q) Which method is used by default exception handler to print stack trace ? Q) Explain throw keyword with its rules ? Q) Explain throws keyword with its rules ? Q) Can we declare unchecked exception using throws keyword in method signature ? Q) What happens, if there are some Java statements after explicit exception thrown using throw keyword ? Q) Why only object of type Throwable (or its sub-type) is allowed to thrown ? Q) Whether it is valid to throw Java object, which isn’t extending any Exception/Error from exception hierarchy ? Q) Whether it is a normal termination or abnormal termination, if we are using throws keyword ? Q) Whether it is possible to create custom exception and can we throw this custom made exception ? Q) Whether it is possible to throw user-defined exception ? Q) How to write custom exception, explain its steps ? Q) Explain Exception propagation ? Q) Explain re-throwing an exception ? Q) Difference between throw and throws keywords ? Q) Difference between try-catch block v/s throws keyword ? Q) Explain the different between final v/s finally v/s finalize() ? Q) Explain the difference between ClassNotFoundException v/s NoClassDefFoundError in detail ? Q) Explain, what are the new features introduced in Java 1.7 version ? Q) Explain Automatic Resource management feature in Java exception handling ? Q) Whether it is mandatory to follow catch-block or finally-block, after try-with-resources statement (try-block) ? Q) How is multi-catch block is useful over traditional multiple catch blocks ? There shouldn’t be any relationship between declared exception-type in multi-catch block. Q) Explain rules for exception handling with respect to method overriding ? Q) What are unreachable block in Java ? Q) Does a method can return an exception ?